These Kem Arrow Playing Cards feature Kem's most popular back design. Made entirely of Cellulose Acetate material, Kem cards are the number one choice for leading casinos and card rooms in 60 countries world wide. You can choose from narrow size (2-1/4" x 3-1/2") and wide size (2-1/2" x 3-1/2") Kem cards. Both are available in Regular Index and Super Index (large numbers and pips). 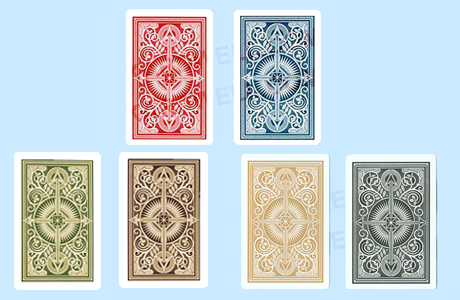 All two-deck sets contain either one red and one blue deck, one black and one gold deck, or one green and one brown deck. For additional information or wholesale pricing on Kem Arrow Playing Cards, please call 1-800-233-0828.